Hello, friends! Happy Sunday! I hope your week is off to a great start and you’re getting ready to tackle the week ahead. Last Friday, I did something I rarely do as a teacher – I took a day off. Yes, I took a mental health day, as we sometimes call the days that we take off when no one is sick, no one has a doctor appointment, we’re not going to a conference/workshop/meeting. I just took a day off. When I was a first and second-year teacher, I NEVER took a day off, partly because I was scared to look weak or undedicated to my career, but also because I didn’t want to leave my classroom in the hands of a stranger – check out this month’s Mystery Post for more information about my control freak nature 😀 After my husband and I had kids, my days off were only to be used for maternity leave, sick kids, or doctor appointments for our girls. So … I rarely take a day off, but sometimes it’s needed. Here’s a fun glimpse into why I took a day off, didn’t feel guilty about it, and why teachers must practice self-care to be the best we can be for our students. Yes, I slept in later on Friday morning. That’s right. I slept in LATER – not late by any means because I still had to get my daughters (and husband!) up and ready for school. Friday was Grandparents Day at my daughters’ school and my mom always delivers the chapel message for the day, so I always at least go to that service 🙂 A downside of teaching in a different town than where we live is that I rarely get to take my daughters to school. I have to leave the house at the same time my daughters and husband do in order to get to work at the required time. So, in addition to sleeping in a bit on Friday, I got to take my daughters to school. It may seem like such a small thing, but it’s one of those “mom” things that I love and do as much as I can because they won’t always want me to do that! I don’t know about you, but I suffer from some pretty major “mom guilt” from time to time. My daughters are both in school and participate in almost a dozen afterschool activities between them, and I volunteer/participate as much as I possibly can while balancing my teaching career, the online college classes that I teach, my blog, my book, speaking engagements, conferences, keeping up with homework, and keeping our house in some semblance of order (it’s a wreck most of the time!). So, when I have a day, or a few hours to chill and be Mommy instead of Mrs. Petty, it helps everyone. Friday was Homecoming for my high school and I was able to walk with my daughters’ school float in the Homecoming Parade – super fun and I got some exercise! Happy Bethany! I mentioned earlier that Friday was Grandparents Day at my daughters’ school. My mom still teaches at their school and isn’t able to have a sub in her class on this super fun day. My dad always comes to Grandparents Day and has an absolute ball hanging out with his two favorite girls (my sister and I have been demoted) during the day. My father-in-law wasn’t able to attend the Grandparents Day festivities this year, and we lost my mother-in-law to flu complications last year. Therefore, I spent the day with my daughters as their surrogate grandparent, alternating classes with my dad so both kids could have fun with Papa, but not be left alone when Papa was with the other kid. I LOVED spending time with my daughters in their classrooms, watching them beam with pride as they showed me their classroom, what they’re learning, projects they’ve made, etc. This is extremely true. When I push pause on my busy life from time to time and focus on being more present with my family, I feel like I’m floating on my back in the ocean. instead of trying to tread water. When I feel like I have a good grasp on my family and personal life, I’m a better teacher. Taking a day off helps me (temporarily at least) feel like my ducks are all in a row. When my ducks are in a row, I feel mentally more prepared to take on the noble challenges that come with being a teacher – the best job in the world. So … if you give a teacher a day off … she’ll be more recharged, focused, and excited to be the best teacher she can be for her students. 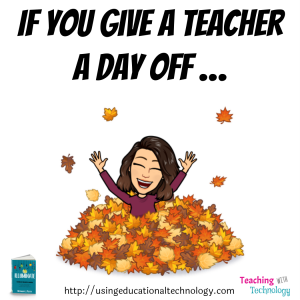 Take a day off, teacher friends. You deserve it, and so do your students. Welcome to my last post of 2017! It’s been quite some time since my last post … I’ve been in full-time Mom mode during Christmas break! My daughters and I have slept in late while Daddy went to work, watched movies, played games, drank hot chocolate, and played in the whopping one inch of snow that we’ve had so far this winter. It’s safe to say we’ve had a great break! As 2017 draws to a close, I’m looking back at the most popular posts from the year that was. Without further adieu, here they are! HyperDocs have taken the world by storm! I took the plunge into HyperDocs at the end of the 2016-2017 school year and, after asking for feedback from my students, decided to use HyperDocs to deliver instruction for each unit this year! 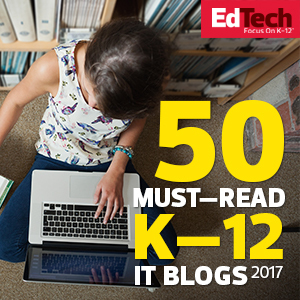 Students utilize a variety of edtech tools to learn content and create representations of their understanding. It’s awesome! Using Flipgrid: I’ve Caught #FlipgridFever! If you’ve been on Twitter any time during 2017 searching for anything edtech related, you’ve no doubt stumbled upon #FlipgridFever. Flipgrid is a fabulous social learning platform that encourages students to respond to questions/prompts in video form. Their classmates can then respond to their submissions, and teachers can provide quick, effective feedback. Students can also add emojis and stickers to their videos … which is super-fun! Global Collaboration projects have been amazing for my students this year! We’ve worked with classes in the UK and Belgium, and I am always looking for more classes to connect with. I think it’s really important for students to not only learn about other cultures but to also connect with people in other parts of the world. Our world is shrinking, and it’s important for our students to learn about and be empathetic to other cultures throughout the world. I’m hoping that these activities help to break down cultural barriers and make us more aware of our ethnocentric tendencies. Holy moly. BreakoutEDU has been ah-mazing in my classroom! It’s so great to watch my students work on the Cs of 21st-century learning. They love finding clues and solving puzzles … and they’re reviewing course content while they do it. There is 100% engagement in my classroom when we do a BreakoutEDU! The “Take What You Need” bulletin board in my classroom has been in the works for a few years. My students are often stressed or upset and in need of motivation and inspiration. Using Google Slides – because I seem to use Slides for EVERYTHING! – I created and printed a presentation that includes dozens of inspirational quotes from Martin Luther King Jr., FDR, Dr. Seuss, and more! I posted these on a bulletin board in the back of my classroom and encourage students to literally take what they need. This has been A HIT and definitely something I will continue in the future! 2017 has been a great year! I’ve learned so much from great educators around the world through my PLN and great conferences, earned awards for my classroom teaching and my blog, and SIGNED A CONTRACT WITH EDTECH TEAM TO WRITE A BOOK! I can’t wait to see what 2018 has in store! You’re a teacher. You have summers off. Oh, friends. When will the rest of the workforce truly realize that we don’t have summers off? Maybe, we just need to clarify what time “off” means in the mind of a teacher. One of the many (lofty) goals, I have created for myself this summer is to create interactive eBooks for students in my American Government classes. 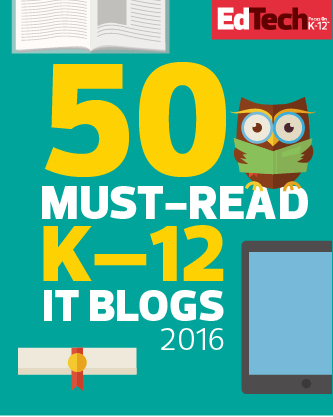 As I’ve mentioned previously, I’ll be using Google Slides to create these eBooks, thanks to a great post from Shake Up Learning. Instead of creating one giant eBook for the entire American Government course (it’s an entire year), my plan is to create mini eBooks for units that we study. This will hopefully make the eBook(and course!) seem less daunting. Seriously. How do teachers without a personal learning network do it? I can’t imagine where I’d be without the wonderful WORLDWIDE community of educators I’ve joined over the past two years. My personal learning network is a source of new information and tools, but also a fount of motivation. There’s something special about interacting with “colleagues” who are “in the trenches” with you. It’s pretty great. I plan to create and share a new hashtag – which will hopefully turn into a Twitter chat – to continue to grow as a teacher through my PLN. After my mind has returned to a somewhat normal state after the end of the school year craze, I reflect upon the big picture of my classroom. What worked? What didn’t? What should I add/change for my classes next year? What can I do differently to enhance the learning environment and increase student engagement? What can I do to help students learn? I’ll be sharing a survey with my students, asking them these same questions and will ACTUALLY READ their comments. This is gutsy, I know! I’ve written before about the purpose of my blogging journey – I want to reflect upon my experiences in the classroom and share those experiences and ideas with the world. I’ll be taking this goal a step further (by July 31) by publishing a new eBook, “The Ever-Changing Classroom,” in which I reflect upon my classroom environment, 2008-2016, and share what I’ve learned as a teacher. I am so excited! I also plan to create “flipped PD” videos of my professional development sessions! One of the major goals I hope to accomplish – no, I WILL accomplish – this summer is to earn my Google certifications. I’m obviously a Google user and hope that by earning these certifications, I can be more of an advocate for GAFE classroom use and share amazing EdTech possibilities with other teachers. When the end of June finally rolls around (I teach a month of summer school), you can bet that I will stop setting my alarm and will roll out of bed whenever my kiddos decide it’s time for me to get up. I will most definitely enjoy a cup of coffee while watching the TODAY show in my jammies until my daughters decide it’s time for Sofia the First. I will definitely finish reading books that I haven’t had time to pick up unless my oldest daughter would rather read a Bob book to me 🙂 So, yes, I will be reenergizing during the summer months. Does it sound like I take the summer “off”? Do I shut myself off from the world of education, and vow not to think about my classroom or the immensely important role I play as a teacher in the lives of my students? Could I lock my classroom door on the last day of school and not think about it again until August? Sure. But I just can’t. I have far too many goals and expectations for myself as a teacher – we have one of the most important jobs in the world. I don’t take that lightly. Happy Teacher Appreciation Week, friends! You’re awesome! Hello. My name is Bethany, and I love technology. 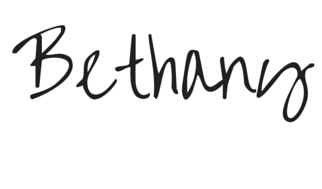 (Hi, Bethany!) By now, you’ve no doubt have figured me out. I love technology. I love its potential in my classroom. I love how I c an use it to increase student engagement. It’s fantastic. However, sometimes, I need to write things down. I know. This is extraordinarily uncharacteristic of a 21st-century educator. Everything is online or in my Google Drive. Why do I need the Ultimate Teacher Binder? Maybe it’s just me, but I like the idea of a teacher binder, and it’s crazy that I’m ending my 8th year teaching and just now making one. Yes, all of my lesson plans are online. Yes, my Google Calendar houses my important agenda. But sometimes, it is nice to have a physical copy of plans, procedures, calendars, student information, etc. 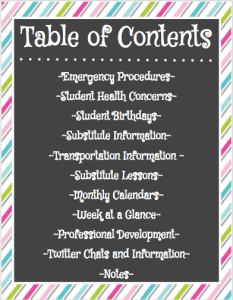 Enter the Ultimate Teacher Binder! Here’s a quick rundown of the contents of this awesome – ultimate, if you will – teacher binder. Student Health Concerns: How helpful will this be for subs?! 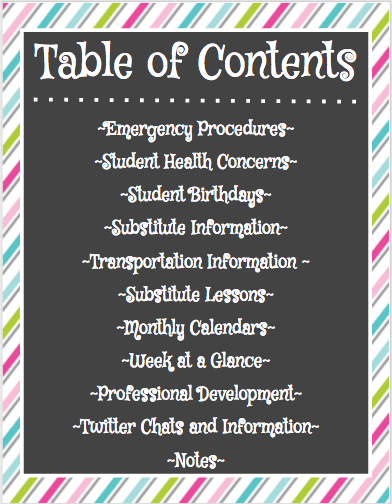 Substitute Lessons: A great spot for those emergency lesson plans. Yes, we can always assign information to our students from anywhere via Google Classroom. However, sometimes we can’t get to our classroom to print off information for our substitute teachers. Monthly Calendars/Week at a Glance: I like to scribble long-term plans and goals for my classes – perfect! Professional Development Info/Twitter Chats: Easily keep track of information to share with colleagues, and what Twitter chats you should join. Definitely bookmark Participate Learning for an updated list (and explanations!!) of Twitter chats! I hope you find my Ultimate Teacher Binder extremely useful! P.S.